Welcome to our first Newsletter of 2019. We do hope you had a good Christmas and are looking forward to a successful New Year. Christmas Celebrations - With only two months between securing a successful ballot and Christmas being upon us we had to get our festive skates on and Christmas plans in action. We hope you enjoyed the new lights on North Street in particular which we thought looked great. Sadly we say goodbye to the Elf Village on North St Green, which the Elf and Safety have deemed unfit for habitation. Events – Considerable efforts went into North Street Nights (ie Thursday shopping evenings on North Street) with much positive feedback of some of the activities, in particular the staging of Scrooge in the Ebenezer Gate pocket park which attracted an extraordinary 160 people. Many thanks to the organisers and volunteers. Next steps – We are now organising an events calendar for the rest of the year with ideas around close-the-road summer festivals for both North Street and East Street and the return of various On the Run events (ie musicians, magicians etc). If you have any ideas in particular that you think would go down well in Bemmie please do email or come along to the next marketing meeting on the last Monday of this month 6pm in Tobacco Factory. Street Cleansing – the increase in graffiti in the area is in fact a city-wide problem. However one of the benefits of having a BID in place and our own funding is the ability to redirect monies to address specific problems. As such the BID will invest in graffiti removal and wash-downs including a vehicle with high powered hot wash for the next six months across the entire BID area. Lower North Street – finally the new buildings in this part of the BID area are complete and the car parking has been returned for... well cars. Whilst its clear this part of Bedminster has seen quite a renaissance in the past few years with numerous new interesting independent shops opening up, this stretch perhaps deserves a bit more TLC in terms of pavements, greening, planters, cycle racks etc. As such we are commissioning a small design exercise by place-making specialists to see what can be done – if anything given the narrow pavements here. East Street – its all change on East Street in the medium term with well over 1000 new apartments either being built (in St Catherine’s Place and Factory 1) or planned around Bedminster Green. The positive impact this will have on East Street should not be underestimated in terms of new local demand (what value in £s around 2000 more people within 2 minutes walk?). However we are keen that these new residents spend as much time as possible on East Street and so we believe now is the time for fresh investment and something of a ‘facelift’ for the street which suffers from high shop vacancy rates (ie 20% compared to the rest of the BID being only around 6%) and a poor ‘public realm’ (ie landscaping). In addition to monies being raised from developers adjacent to East Street we are making the case for East Street to be nominated by the council for the Future High Street Fund which would mean several £m worth of much needed investment. If you are interested in becoming more closely involved with the BID, we are an informal, friendly group, whose basic duties are to direct spending for the BID and Town Team. The BID Board meets 6pm on the first Tuesday of each month. Please do get in touch if you'd like to get involved. Alternatively a marketing (and arts, culture) group meets on the last Monday of every month also at 6pm and a Built Environment Group on the first Tuesday monthly at 4pm (please see our calendar here). Alternatively if you prefer drop us a line or telephone us for a chat to discuss any ideas you have that you think the BID should be pursuing. Bedminster BID funding is generated via a small levy on all eligible businesses in the area and paid into a central 'kitty' in November each year, to be spent on projects that benefitBedminster businesses. You will recall from our last newsletter we were hosting an important meeting jointly with Action Greater Bedminster - BEDMINSTER'S SHOPS IN 2030: WILL THEY STILL BE HERE? Tomorrow Tuesday at 6pm is the last board meeting of the year and will last only half an hour before Christmas drinks get together invitation to all businesses in the BID area – hope you can join us at 6pm for the board meeting or 630pm for a drink and informal chat if you wish about the BID going forward – at Wetherspoons on Cannon Street. Christmas Tree Illuminations: To celebrate the BIDs return we have taken the opportunity to give our large pavement trees, which reside on North St and West, a bit of much needed love and attention. Taking inspiration from none other than Paris’s Champs-Elysées we will be be creating a little something extra for this years tree illuminations. Winter Lantern Parade: Bedminster’s hugely iconic and much-loved Winter Lantern Paradereturns for its seventh year. Expect the biggest and best lantern parade yet as the entertainment starts on the traffic free route from 4pm, followed by the spectacular display of lanterns of all shapes and sizes. Saturday 8th December, 4:00pm – 8:00pm, North St.
East Street Festive Illuminations: The the first time in many years we will be creating festive illuminations running down East St. Due to the nature of the road these have been designed to complement the changing architecture and utilise the nooks and crannies the buildings create. East St property owner have been very supportive of this project and we were excited to see the lights turned on for the East St Fair 1st Dec.
West St Carols: Head on down to West Street and spread some Christmas cheer. The Bedminster Citadel Salvation Army Band will be on hand, providing a glorious festive backdrop and with mince pies and mulled wine, what’s not to love! Tuesday 18th December 6pm – 7pm, Mezzaluna, West St.
North Street Nights: In its second year NSN has already got over 40 businesses proudly taking part and hopefully a few more joining in. Running Thursday 6th, 13th and 20th Dec we will see North St Green being used for community festive fun, while the shops keep their doors open till 8pm for all Christmas shopping needs. The North St Nursery has kindly got involved to host a Santa’s Grotto (6th and 13th) and Elf Post office (20th) - Jocelyn is still searching for a Santa so please get in touch if you know of anyone with previous experience of being the big man himself. Gift Guide: Thank you to everyone who sent in gifts for this years guide. The A5 pamphlet is jam packed with a wide range of Christmas goodies that will be distributed with the next edition of the South Bristol Voice. With 20K copies going out this year we hope to promote the variety of products available from our local stores. Have a sneaky peak HERE. Santas Letters: Building on the success of last years Santa letters we have enlisted a community of older Elves to hand write responses to local children. Letters posted between 1st - 15th Dec in any of the post boxes, which can be found on East St, West St and North St Green, will be ready for collection from The Elf Post Office (20th Dec). If you or anyone you know would like to join our Elf army to help with responses please contact Jocelyn - this years head Elf - for more details. If you are interested in becoming more closely involved with the BID, we are an informal, friendly group, whose basic duties are to direct spending for the BID and Town Team. The BID Board meets 6pm on the first Tuesday of each month. Please do get in touch if you'd like to get involved. Alternatively a marketing (and arts, culture) group meets on the last Monday of every month also at 6pm and a Built Environment Group on the first Tuesday monthly at 4pm (please see our calendar here). Alternatively if you prefer drop us a line or telephone us for a chat to discuss any ideas you have that you think the BID should be pursuing. We are most grateful to local accountants Tyrrell Procter and communications experts Plaster for their generous pro bono contributions to our activities. BEDMINSTER'S SHOPS IN 2030: WILL THEY STILL BE HERE? We need you! Bedminster's businesses, residents and community groups are invited to help us shape the next five years of the BID. What do you want from your high streets? Does it matter? Do you care? We do. If you do too, join us for a couple of hours to hear and offer opinions about how businesses, residents, community groups and public authorities can work together to ensure the future of Bedminster's retail and leisure streets at the heart of this great community. Clearly this is an opportunity for the BID and all businesses to engage with their local customer base and we hope come up with some great new ideas around what will help us continue improving the offer for residents and visitors alike. No need to book – please just come along. £M FUND ANNOUNCED FOR EAST STREET - CHRISTMAS MUST BE COMING! You may have noted some rare good news in terms of government funding with the announcement by the new combined authority of a £10m fund to help high streets and the decision by Bristol to make East Street a pilot - please click here for more. With lots of festive preparation underway we thought it would be good for a little update and shout out for input or help were appropriate. returns for its seventh year. Expect the biggest and best lantern parade yet as the entertainment starts on the traffic free route from 4pm, followed by the spectacular display of lanterns of all shapes and sizes. Saturday 8th December, 4:00pm – 8:00pm, North St.
East Street Festive Illuminations: The the first time in many years we will be creating festive illuminations running down East St. Due to the nature of the road these have been designed to complement the changing architecture and utilise the nooks and crannies the buildings create. East St property owner have been very supportive of this project and we are excited to see the lights turned on for the East St Fair 1st Dec.
North Gallery Workspace, a new contemporary arts space offering artist and hot-desking opportunities, has recently opened on North St. Shaped by the local community its newly renovated facilities offer a space for a variety of creative and educational pursuits. The space lends itself to community and consumer facing activities alike. If as local businesses you are looking to host events big or small please get in contact with them to find out more details on how they might support you. 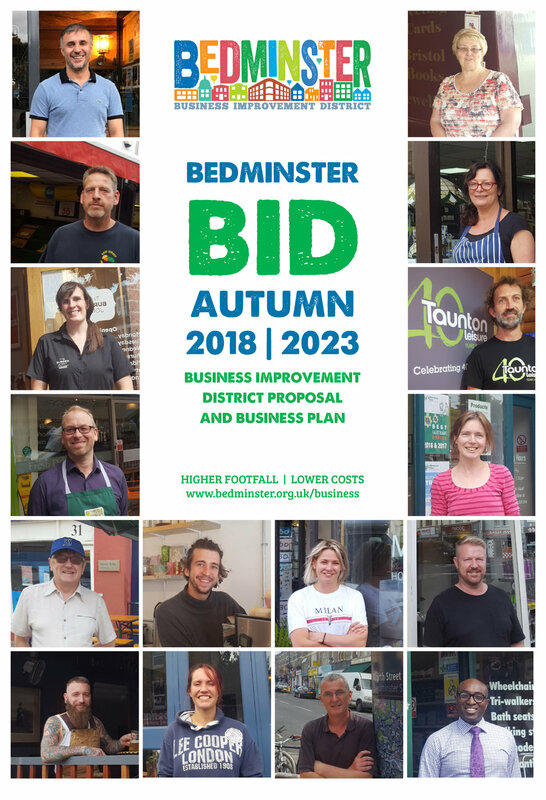 As you know the BID succeeded in a September ballot (more than 2:1 in favour) in its efforts to continue working on behalf of the businesses of Bedminster to ensure the vitality of the main retail and leisure streets. Thank you for your support if you voted yes and we hope to convince you of the merits of the BID if you voted otherwise. Not a lot to be frank as for six months the BID had no revenues at all whilst we prepared for the autumn ballot. This has meant much of the work around marketing, events and street enhancement was put on hold or did not happen at all sadly. East St - New festive lighting will be installed along East St created by local carpenters and designers from Hot Soup House. Nestled in the buildings rooftops these will decorate the street with playful lighting as the nights draw in. Beaming Bedminster – Our larger than life Christmas decorations will be popping back up in shop windows along North, Canon and West St. All 52 handmade units are up for grabs and going fast - if you are interested in having one again this year, or for the first time, please email Jocelyn to discuss being part of the project. Elf Village – North St Green will see our much beloved Elf Village installation coming to town for its final year, so make the most of it and take the whole family. Tree Lighting – Its time to invest in new festive street lighting for our large North and West St trees in the run up to their big Christmas switch on. North Street Nights – Building on last year’s trial we hope to see another successful turnout for these Thursday late night Christmas shopping opportunities. This year NSNs will be running over 3 Thursdays in Dec, 6th/13th/20th, is would be great to see as many businesses as possible opening up their doors and being part of, what we hope to be, an annual tradition. Or will it just be Amazon and faceless corporations? We need you! Bedminster's residents are invited to help us shape the next five years for supporting Bedminster's businesses. 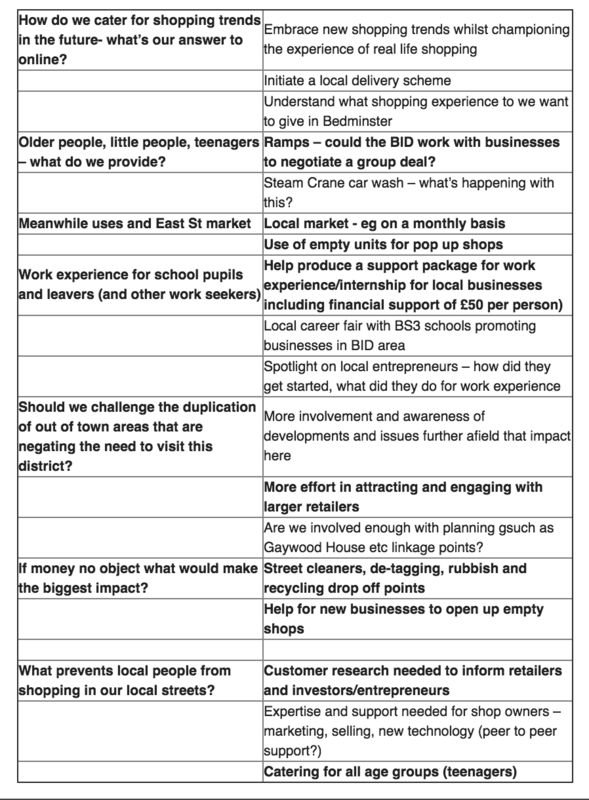 What do you want from your high streets? Does it matter? Do you care? East Street Bus Diversions – you may have completed a short bus survey for us recently. The overwhelming response was not surprisingly that buses should not be diverted from East Street in favour of Malago Way (ingoing) although there was a significant portion open to the idea of testing the concept at a later date provided the street footfall and sales performance had significantly improved on the back of new residents from all of the new development and the street is significantly upgraded and fit for 21st century shopping. Cleaner Streets – this is a growing concern for many businesses and not an easy one to deal with. We continue to hold regular meetings with Action Greater Bedminster, the council and Bristol Waste Company and are investigating additional spending by the BID to raise the bar to a higher standard. We understand that Bedminster is cleansed to a ‘B’ standard currently and are keen to understand the implications and cost of improving this to an ‘A’ standard. Lantern Parade (8th Dec) – do you have palns to do something a little special outside your shop to show support for this great community event? Ideas are welcome and all invited to be involved. Friendly Streets - Community volunteers have been warmly welcomed by local businesses who are working together to make our area one of the friendliest and most accessible in the city. The Community Project, including groups like BS3 Community, Bedminster Social Club and the Bristol Dementia Action Alliance, is offering information and assistance around responding appropriately to customers that might have dementia. Proactive businesses will be added to the city-wide list of ‘Dementia Friendly’ organisations and feature in local publicity around making Bedminster Bristol’s first ‘All Age-Friendly Neighbourhood’. The project also explores how Bedminster increase support for people with physical disabilities or mobility issues. Take a quick look at the pavement outside your premises. Is it clear of obstructions and trip hazards? If you want some help in making your premises or your bit of the street more accessible to a wider range of customers, please contact Ben on benbarker@blueyonder.co.uk. Ongoing projects – our main business info page at www.bedminster.org.uk/business lists a series of projects we commenced prior to the BID ballot and we are continuing with these. They include greening projects (planters etc), utilities and waste saving schemes, shop front programme, street art and marketing and promotion (in particular social media and press relations). ITS A YES FROM BUSINESSES! We are delighted to report the BID ballot result was positive with more than 2:1 voting for another five years of the Bedminster BID. The full result showed 68% voting in favour by number of businesses and 71% in favour by rateable value - this was achieved on a higher than average turnout (for BIDs) of 51%. This result assures the BID of funding for the next five years - but this money will only mean something if we spend it really well. What ideas do you have for the BID and Bedminster's retail streets? If you are interested in becoming more closely involved with the BID, we are an informal, friendly group, whose basic duties are to direct spending for the BID (and Town Team). We meet 6pm on the first Tuesday of each month. Please do get in touch if you'd like to get involved. Alternatively a marketing (and arts, culture) group meets on the last Monday of every month also at 6pm (please see our calendar here) or drop us a line or telephone us for a chat to discuss any ideas you have that you think the BID should be pursuing. Bedminster BID funding is generated via a small levy on all eligible businesses in the area and paid into a central 'kitty' in November each year, to be spent on projects that benefit Bedminster businesses. Please note that the ballot is about to enter the final week and ballot papers must be returned by 13th September. If you have lost your ballot paper then the process for a replacement is to email for a replacement ballot paper, providing a scanned letter and a scanned copy of ID (detail below) to electoral.services@bristol.gov.uk. We firmly believe the benefits of the BID greatly outweigh the costs as evidenced by the dramatic drop in shop vacancies over the past five years - down over a third. Full details of what we aim to do and how we are organised are in the Bedminster BID Renewal Proposal and Business Plan already circulated, but if you have not seen it yet, please click here. A quick note to say please keep a watchful eye out for your GREEN BID ballot paper which you can expect in the post this week - you have 4 weeks to make your vote count. We have of course circulated the business plan in hard copy and via this newsletter, however if you have have not seen it please click this LINK. Please do not hesitate to get in touch if you have any questions or queries. We do of course hope you can vote positively to help ensure the healthy future of Bedminster's retail, leisure and commercial streets and help us build on the achievements of the last five years. Finally we are grateful to local accountants Tyrrell Procter and communications experts Plaster for their generous pro bono contributions to the BID’s activities. As we reported in our last newsletter we were exploring the possibility of another ballot in order to secure the future of the BID for a further five years. Consultation has been very positive in favour of a further ballot and as such we have now revised the five year business plan and commenced circulation of hard copies to all businesses affected. Please click here to open the business plan. Why a second ballot so soon? You may recall the ballot result from earlier this year was negative despite 70% of businesses voting in favour of the BID. This is because the ballot must be won on the basis of two counts - by number of businesses and also by rateable value. The second count by rateable value was lost because the largest superstore in Bedminster voted NO and its massive rateable value was enough to swing the ballot into negative territory. Given a significant majority of businesses voted positively towards renewing the BID for a further five years the BID Board decided to consult businesses again on the possibility of a new BID that would exclude the largest ratepayer and allow the smaller businesses to work together to improve marketing, street enhancements, safety and ensure a strong voice for Bedminster businesses. Do we need a BID? Traditional high street sales continue to fall and shop vacancies continue to grow in many locations with numerous household names closing their doors for the final time. In Bedminster alone in the past few months we have had the closure of Bon Marche and the announcement that Argos is to depart. In our view it is essential we respond by improving the shopping experience in Bedminster and create something based on uniqueness, authenticity and community – ie something it is impossible for the internet to match. A BID will help greatly in this regard. Other BID Projects: The result of the March ballot means the BID has missed out on six months worth of income and as such many projects and activities have been seriously curtailed. However we are able to guarantee some Christmas events - given this is the key time of year for most businesses (such as The Lantern Parade, Christmas Fairs and Lights etc) - and a small number of other events in the summer. We have also been successful securing grants from other sources particularly for East Street. Bedminster Green Developments: as reported in earlier newsletters there is now a large amount of property developer activity proposed around 'Bedminster Green' - the area between East Street and Windmill Hill. Six developments have the potential to deliver up to 1500 new homes within a few minutes walk of East Street, meaning a major injection of new footfall and demand for shops and other businesses in the area. We are all aware that lower East Street has probably been suffering more than most parts of Bedminster in terms of vacant shop units and have long recognised the benefits of redevelopment close by. With this in mind the BID is working hard with the council to ensure these new developments benefit East Street. We are also working with local architects Purcell to develop a vision for the area that we hope will enable it to thrive in the 21st century. For further details of the written policy the BID has produced for East Street development please see the last newsletter. BID Community Bus Service: a number of businesses have highlighted that large pockets of South Bristol have very poor access to Bedminster and there is a need for a community bus service to fill the gaps not being served by the larger bus operators. Unfortunately this is a very expensive endeavour with just a 16 seater bus operating six days a week during work hours costing circa £100,000pa. However we have unearthed a major grant application opportunity aimed at 'Connecting Communities' and we are hopeful our application will be successful - more details to follow. Bedminster BID intends commencing with a further round of consultation with businesses in advance of a possible ballot in August/September. As you will recall the ballot result from earlier this year was negative despite 70% of businesses voting in favour of the BID. The ballot must be won on the basis of two counts - by number of businesses and also by rateable value. The second count by rateable value was lost because the largest superstore in Bedminster voted NO and its massive rateable value is enough to swing the ballot into negative territory. DO WE NEED A BID? Retail sales 'fell off a cliff' in April with the worst month recorded since records began in the mid 1980s according to BRC (British Retail Consortium). The growing impact of the internet means traditional shopping locations will continue to be negatively impacted with the latest sectors to be badly hit including banking and travel. Amazon et al will not be satisfied unless we are ordering and drinking cappucinos out of our phones and so it is in our view essential we respond by making an experience - based on uniqueness and authenticity - that it is impossible for the internet to match. A BID will help greatly in this regard. ‘Clutter Patrol’ involves us walking the retail streets with relevant officers from the council and other agencies to inspect the state of pavements in terms of blockages and litter etc. The next one will focus on East and Cannon St and be on Wednesday, 23 May starting at 10.30am. All are welcome. We will meet near the Steam Crane and walk along Cannon and East Street and back. We hope to see you there. Other BID Projects: The result of the March ballot means the BID has missed out on six months worth of income and as such many projects and activities have been seriously curtailed. However we are able to guarantee some Christmas events - given this is the key time of year for most businesses (such as The Lantern Parade, Christmas Fairs and Lights etc) - and a small number of other events in the summer. We are also looking for grants from other sources such as local landlords and/or developers particularly around East Street in whose interest it is to improve the local area. 1. Clear, attractive, safe (active ground floors) routes connecting the Green Bus Stops and East St through SCP and one other - Little Paradise or Stafford? If you are keen to find out a bit more about one of the developers, Dandara who have a major site on Little Paradise St, head to https://littleparadisebedminster.info/ where they have just published a website with details of their proposal. Ballot papers will be arriving in the post from 23rd February - they are coloured green to stand out a little. Businesses have four weeks to complete them and return in the addressed envelope provided. We firmly believe the benefits of the BID greatly outweigh the costs as evidenced by the dramatic drop in shop vacancies over the past five years – down over a third. Full details of what we aim to do and how we are organised are in the Bedminster BID Renewal Proposal and Business Plan already circulated, but if you have not seen it yet, please click the image below. We were delighted to circulate hard copies of the Bedminster BID Renewal Proposal and Business Plan 2018-23 last week, which aims to raise £750,000 for investment in improving the area for businesses. If you haven't seen seen it yet, please click the image below. Inside you will find all you need to know about what has been achieved over the past five years by businesses working together and - more importantly - the plans for next five years. The future of the BID is only possible if a majority of businesses vote YES in the ballot in March, to ensure essential BID funding continues – the average cost for independent businesses is only around £4 per week. We firmly believe the benefits of the BID greatly outweigh this cost as evidenced by the dramatic drop in shop vacancies over the past five years, the successful opening of many exciting new outlets attracted to Bedminster, and money saving offers exclusive to businesses in the BID area (such as 20% discount on waste collection services). We hope you have been happy with the BID and wish to support it going forward by voting YES in the ballot. If you have any questions at all please do not hesitate to contact George Grace on 07801790645 or email business@bedminster.org.uk and we will be happy to telephone or meet you. As the BID approaches the end of its five year term most of our attention by necessity is upon the renewal process. However we have one new event – or series of events – which will we hope bring some additional footfall to Bedminster’s pubs and should be worth some useful PR. Every Tuesday the aptly named ‘Blood and Butchery in Bedminster’ delves deep into the area’s gruesome history and how its pubs play a key role in these stories; including tales of body snatchers, concrete coffins, hangings judges and the most notorious heist in living memory. Created by the theatre company Show of Strength, Blood and Butchery in Bedminster begins at The Rope Walk on Bedminster Parade and explores tales of murder, mystery, betrayal and bullion, visiting pubs and landmarks along the way. Bristol Food Connections is back and presents a chance to take part in a celebration of all that is great about Bristol’s food this June 11th-17th. Do you have a food-led activity you would like to shine a light on or wish to bring communities together to celebrate your food culture? This year the theme is TIME. Calls are out for feasts and celebrations, cooking demos, talks and debates, children’s activities, food campaigns, wine tastings, art installations, pop-up markets, supper clubs, farm tours, share a dish days. If you have an idea please contact Bristol Food Connections direct. Submit your event idea at www.bristolfoodconnections.com/run-an-event/ and they will contact you to help develop your ideas. The next meeting of the Board is February 27th at 6pm at The Steam Crane. All local businesses are invited should they wish to attend when we intend to have a short meeting and a few drinks. If you are interested in becoming more closely involved with the BID, we are an informal, friendly group, whose basic duties are to direct spending for the BID and Town Team. We invariably hold our meetings at 6pm on the first Tuesday of each month, and are looking for directors who can commit to a minimum of 5-6 meetings per year. Please do get in touch if you'd like to get involved. East St Christmas Market on Saturday 25th November. Festive entertainment for the whole family including Santa’s Grotto, Santa’s Elves and reindeer, child friendly rides, street food and an a free arts and craft area. See here. Christmas Chalk Walk will be taking place on East St at the SAME time. Visitors can create their own Christmas street art using chalk provided. Draw your own festive design on the floor and make yourself part of the scene for the perfect Christmas card photo. SPZero76 will also be making an appearance to add his own mark to the proceedings. See here. Elf Village will be returning to North Street Green. See how the elves have been getting on at Elf and Safety HQ, Santa’s Workshop & the Elf Inn Hotel. Through December. North Street Nights Throughout the festive season, North & West Street retailers will be opening their doors a little later than usual. Allowing shoppers to head to the area after dark and pick up some special Christmas purchases. Thursday 30th November & December 7th, 14th and 21st. Free Christmas Play at Bubble Play Café. Every Saturday afternoon in December, Bubble Play Cafe will be free for little ones! Head on down to The Bubble Play Cafe on East Street between the hours of 2pm & 5pm to make the most of this amazing offer. All our events are designed to attract new customers to our retail streets and/or encourage more loyalty and frequency with existing shoppers in the area. Also see our new gift guide here. Blood and Butchery in Bedminster – in collaboration with local theatre company, Show of Strength, will introduce locals and visitors to some fascinating pubs – and the dark events that happened nearby. Meeting and starting at the Rope Walk on Bedminster Parade, we’ll take up to 20 people on a journey of exploration that includes 4 pubs and a graveyard. True, dark and strange stories, ranging across the centuries, close to where they happened - with stops for warming drinks on a dark night. See here. To start the process we completed a consultation process to gather as much feedback as possible from Bedminster businesses regarding the activities the BID should pursue. This will inform our BID Business Plan and Proposal for the next five years which we will publish early in the New Year. Please remember we have an arrangement with Bristol Waste Company in which all businesses in the BID area enjoy a 20% discount on high quality waste services. See here. A report has just been published looking at the changes that have occurred in consumer behaviour with regard to bricks and mortar retail, and the concomitant changes brought about in the eating out market. Tougher trading conditions have forced operators to exploit their assets through the day with the greatest rate of growth in the breakfast period. The next meeting of the Board is the Annual General Meeting (AGM) – Tuesday 5th December 6pm at The Steam Crane. All local businesses are invited should they wish to attend when we intend to have a short meeting and a few drinks. Having met with Bristol Waste Company, Bedminster BID are delighted to announce an agreement for a 20% discount on high quality waste services for ALL levy payers. See here. If you wish to get involved in any event in particular please do get in touch. Contact simon@weareplaster (the BID’s retained marketing and PR advisers). If you have any ideas to add or would like to get involved please contact Tom or Simon. To start the process we recently completed a consultation process to gather as much feedback as possible from Bedminster businesses regarding the activities the BID should pursue. This will inform our BID Business Plan and Proposal for the next five years which we will publish in the autumn. Bedminster Pharmancy on Cannon Street are on a mission to make Bedminster the biggest dementia friendly shopping district in England. Watch the short video explaining how you can help here. The accompanying accreditation gives carers and families affected by this illness the confidence that a particular business will be understanding and supportive of their needs. Bedminster Pharmacy have kindly offered to help businesses with any queries during or following on from the training, providing materials and signposting to local support services helping sufferers, carers and families to live well with dementia. Manager, Ade Williams says - "It would be nice if the Bedminster could have the highest concentration of Dementia Friendly businesses in England." A FREE award scheme publicising food businesses that are taking action to offer healthier and more environmentally friendly foods. · The scheme offers guidance on how you can meet the increasing demand for healthier and more environmentally friendly foods and save money while you are doing so. · Research suggests that similar schemes have had a positive impact on businesses. · Businesses will receive an award certificate and window sticker and access to other electronic resources. · You will also be published on the award website and promoted elsewhere as opportunities arise. · Firstly fill in the online questionnaire here. · You will also be able to save your application to complete at your convenience. · Select from a range of simple actions that you can take, or are already taking. The more you do, the higher level of award you get. · Whatever type of food business you have, there will be actions you can take. The next meeting of the Board is the Annual General Meeting (AGM) - Tuesday 1st August at The Steam Crane. All local businesses are invited should they wish to attend. Key items are the AGM (to elect new directors, review Year 4 of the BID) and commence discussions for this Christmas in Bedminster (yes, Christmas is coming!). We are now seeking nominations for new directors - please email your suggestions to George Grace (george@towncentred.com) by 29th July 2017. We are an informal, friendly group, whose basic duties are to direct spending for the BID and Town Team. We invariably hold our meetings at 6pm on the first Tuesday of each month, and are looking for directors who can commit to a minimum of 5-6 meetings per year. Please do get in touch if you'd like to get involved.